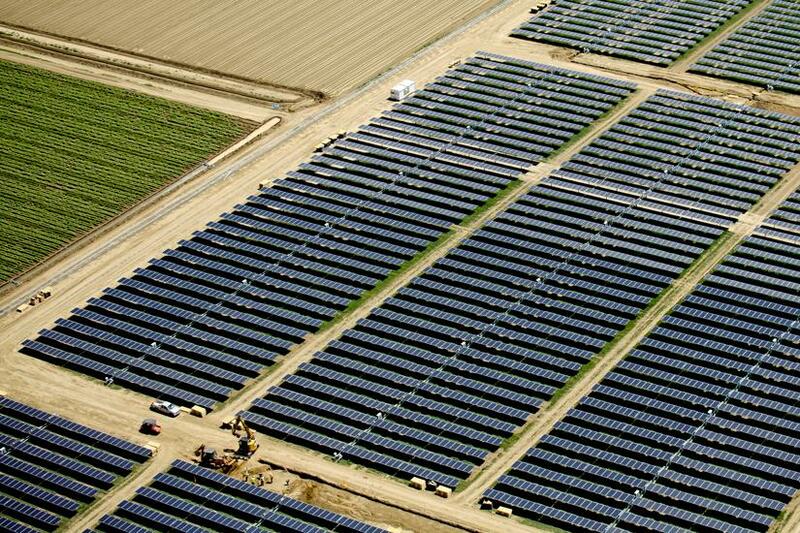 The university's 16.3-megawatt (AC) solar power plant, near the UC Davis campus. UC has purchased 80 megawatts (MW) of off-campus solar — enough to supply 14 percent of total electricity use. Campuses have also installed nearly 80 on-site solar photovoltaic systems. Together, they produce another 36 MW of carbon-free electricity. An additional 13 MW of on-site solar is in development. The University of California was recognized by the U.S. Environmental Protection Agency today (Oct. 23) for its commitment to ‘green’ energy. UC was one of only eight organizations nationwide to receive an Excellence in Green Power Use Award from the EPA. The annual award recognizes the nation’s leading green power users for their commitment and contribution to helping advance the development of the nation’s voluntary green power market. The EPA defines green power as electricity that is generated from renewable resources, including wind, solar, geothermal, biogas and low-impact hydropower. In recognizing UC’s commitment to these environmentally-friendly sources of electricity, the EPA said that the university purchases more than 128 million kilowatt-hours (kWh) of green power annually — supplying about 10 percent of UC’s total electricity — or enough energy to power 10,000 average American homes each year. UC President Janet Napolitano, who in 2013 set the university on a course towards becoming carbon neutral by 2025, said she was thankful to see the 10-campus system be recognized for its efforts to move toward green energy sources. The university’s Carbon Neutrality Initiative, which Napolitano announced in Nov. 2013, commits UC to emitting net-zero greenhouse gases from its buildings and vehicle fleet by 2025, something no other major university system has done. The initiative builds on UC's pioneering work on climate research and furthers its leadership on sustainable business practices. UC is improving its energy efficiency, developing new sources of renewable energy and enacting a range of related strategies to cut carbon emissions. David Phillips, UC’s associate vice president for energy and sustainability, attended the 2017 Renewable Energy Markets Conference in New York, where EPA bestowed its award. He acknowledged that the 2025 carbon neutrality goal is ambitious, but said that campuses are thinking creatively about how to succeed. “Cost-effectively cutting emissions requires both on-campus action and systemwide collaboration, and this is showcased in UC’s work to develop new renewable energy supplies,” Phillips said.